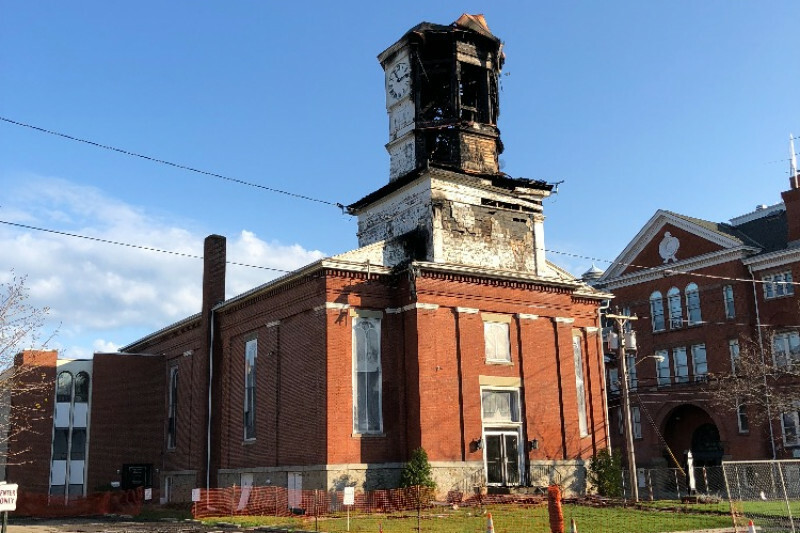 On May 4, 2018, Family Church Fredonia was affected by a fire in the clocktower of the building. The building has been deemed structurally sound, but extensive repairs and renovations will be required to the building, which suffered water and smoke damage. While we thankfully have insurance, many community members have expressed an interest to rally behind the cause of restoring this beautiful piece of Fredonia's history. We will not be brought down by this, but we rejoice that God will turn it around for us. We'll land higher than where we started! If you'd like to donate, we'd be most honored to accept it and put it toward the resotration of this historic landmark. While we are starting with a goal of $100,000, the cost of repairs will far exceed this number. We will gladly increase our goal as funds arrive, and we restore the building to an even better place than it was before. In the early 1990s, the Fredonia Rotarians led a campaign to paint and patch the steeple and clocktower of the historic Fredonia Baptist Church in Fredonia, New York. When Family Church Fredonia purchased the building in 2015, many renovations were required to restore it to its former glory as an historic landmark in our beautiful village. With a goal of restoration, the church has invested nearly two years and $1.3 million in renovations and repairs to the interior and infrastructure of the building, and began having services there in April 2017. While there are many phases remaining to the restoration projects, they are mostly interior; air conditioning, the offices, a floor dedicated to young adults and a new kitchen. However, one large piece of the puzzle remains - and it stands as a beacon to the whole community: the clocktower. Rev. Michael Lokietek, who leads the congregation with his wife Rev. Nancy Lokietek, has enjoyed seeing the village as a whole be restored and has supported many movements to beautify the downtown community. Family Church believes the essence of this beautiful space goes beyond the walls of the church, taking their place in the aesthetically rich history of Fredonia. That's why this fund has been set up. As a community, Fredonia can rally behind this cause and help restore a former gem of the downtown area. Thank you for your help in restoring not just this historic steeple, but the community as a whole. Donations recevied through GoFundMe are not tax deductible. However, Family Church Fredonia is a 501(c)3 charitable organization, and any donations received directly by the church are tax deductible. Feel free to mail a donation to the church directly (PO Box 179, Fredonia, New York) or you can donate via PayPal at paypal.me/fcfredonia and indicate your donation for 'Clocktower Restoration' and you'll receive a receipt as well.